Blues coach Brad Fittler says he expects more from NSW playmakers Nathan Cleary and James Maloney, describing Penrith's attack as "terrible" after the opening month of the 2019 season. The Panthers have been less than impressive in racking up two wins and as many losses to begin Ivan Cleary's second tenure at the club, with critics highlighting a lack of cohesion and ball retention, and Cleary and Maloney are in the cross hairs. Penrith snuck home against the Wests Tigers in golden point on Friday night with Cleary making two big plays that got the team over the line. Cleary and Maloney have played well sporadically through the first four rounds but the stats aren't kind when assessing the side's ability to cross the stripe. Prior to scoring the late equaliser against the Tigers to send the match into extra time, the last time Penrith scored a try was in their round two win over Newcastle. Cleary and Maloney failed to combine for a four-pointer in the side's thrashing at the hands of Melbourne in round three. The Panthers have scored 39 points in the first four games, an average of 9 points a match. They're dead last in line-breaks and line break assists, while the Knights are the only team to score fewer tries to start the season. The poor strike-rate not only heaps pressure on Cleary and Maloney at club level, the duo's Origin series-winning combination is also under threat according to Fittler. After declaring Cleary and Maloney were never "a great combination" ahead of the Wests Tigers clash, a disappointed Fittler backed up his initial appraisal on Nine's Sunday Footy Show. "At the moment their attack's terrible," he said. "They're not combining well, they're not scoring tries. The last time they scored before the death of that game (Tigers), they didn't score one against Melbourne they only kicked a goal. So you had to go two weeks before they scored a try. They've got to work out some stuff, they're not going well at all." Sharks skipper Paul Gallen defended Cleary and Maloney's form so far, underlining a lack of dominance from Penrith's forward pack as a contributing factor. Yet, Fittler was defiant in his criticism of both players and insisted Cleary and Maloney were good enough to overcome troubles in the forward park. And it's not like Penrith haven't had their opportunities. In the heavy 32-2 loss to the Storm, the Panthers were gifted with some 30 looks at the Storm's line in the opening 30 minutes, only to be turned away every time by a stubborn Melbourne defence during freezing conditions in Bathurst. Whether or not that played a role in the inept performance doesn't matter to Fittler, the NSW coach tasked with trying to guide NSW to back-to-back series wins for the first time since 2003. The Blues legend said there's no excuse for not scoring considering the amount of chances Penrith had. "You've got to be looking at your halves. If you've had so many cracks at it and you can't score a try then you're obviously not doing something right," Fittler said. "if you're getting that many shots and you're the State of Origin halves you need to be scoring tries." Gallen was optmistic about Cleary's form but said Maloney needed to pick up his game if he's to be considered for Origin. 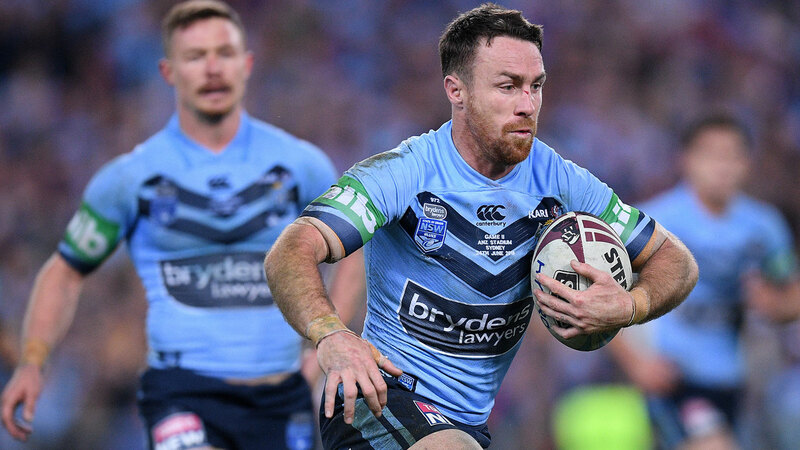 The former NSW captain admitted the start to the year had been less than ideal for both players but pointed out that Cleary displayed match-winning qualities against the Tigers and still had time to improve before Origin I on June 5. "Origin is still another 7 or 8 weeks away. He (Cleary) steps up the other night and ices the game and gets the job done and shows he should be there, he's got two feet in the door." The Sharks veteran said the only other player that deserved to be mentioned as a possible replacement in the halves is Roosters' star Luke Keary. The 2018 Churchill medalist has been outstanding this season, ranking second for try-assists and in the top ten for kicking metres. Fittler and fellow Nine commentator Peter Sterling agreed that Cleary has shown plenty of commitment this year and there have been enough positive signs to suggest a change in fortune is just around the corner. Sterling spoke glowingly about Cleary's temperament under pressure and said his potential was never in doubt. "He's got the best head on his shoulders and defensively he's been really good. When you can say those two things about an individual player when things aren't going well, it speaks volumes about the player." Penrith will play away from home over the next two rounds with trips to the Gold Coast and Cronulla, before hosting the Rabbitohs in round seven.